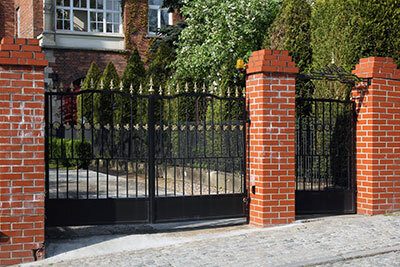 Whenever you are in need of a great company that knows the ins and outs of the gates and fences industry, the first call you make should be to the San Diego Driveway Gate Company. We several services at our company like: installing and repairing gates, and even installing and repairing a varied number of types of gate motors and openers. Once you have installed a driveway gate, the next best thing to do is to get an opener, as it will make opening and closing the gate much easier for you. So rather than getting out of your vehicle each time you have to open or close the gate, you can simply press a button or enter a code. We also ensure that we have a variety of the top brands of gate openers for you to choose from, as we only offer our customers the best that money can buy. Some of the top brands of driveway gate openers that we sell and install are: All-O-Matic, Eagle, DoorKing, FAAC, Elite, and Ramset. There are three primary types of gates that exist in the market, which are: the sliding gate, bi-parting pair gate, and the single swing gate. We’ll help you decide which driveway gate opener is best suited for your gate. This is primarily due to the type of gate that is installed on your property, as each brand has its own properties. After the driveway gate opener has been installed, you may want to contemplate installing a driveway remote, as it will offer you a hassle-free option of leaving and entering your property. In the event that you encounter any minute problems, our contractors will provide you with troubleshooting guidelines after installation. Besides from installing and repairing driveway openers that are bought from us, our San Diego Driveway Gate Company also offers repairs services for openers that have been pre-installed by another contractor. Our driveway gate company is always available to attend to your every gate opener-related need. We take pride in selling, installing and maintaining high quality driveway gate openers for our clients, as they deserve the best. Our San Diego Driveway Gate Company is the go-to gate company in the community, because we offer the best of driveway gate services available. We also offer of customers free price quotes and estimates. We aim to be the company that provides the best services at the best prices. Call us today, so that we can start the installation or repair process tomorrow.